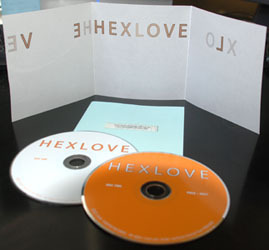 A TWO DISC SET THAT REPRESENTS TWO SIDES OF HEXLOVE. ONE DISK IS FILLED WITH SPACIOUS SOUNDS AND REVERBERATED VOCALS WHILE THE SECOND IS FILLED WITH FRANTIC DRUMMING AND ANGULAR COMPOSITIONS. HEXLOVE BRINGS A UNIQUE MUSICAL EXPERIENCE THAT MIXES DRUMS, VOCALS, GUITARS AND ELECTRONICS INTO A GENRE ALL HIS OWN. 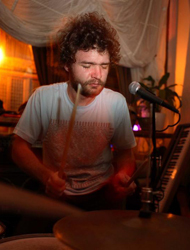 ALONG WITH HEXLOVE BEING IN THE BAND, “WHO’S YOUR FAVORITE SON GOD”, HE HAS ALSO WORKED ALONG SIDE ZACH HILL (HELLA). Separated into two discs, with a lovely vellum booklet and a mirrored picture of tracks in snow. Soft, drapey, strumming, would at first be classified as easy listening except for the thick atmospheric drone and gently protesting vocals on top. Something a bit urgent about it, like singing worshipfully of the cold but you've got to get indoors before you catch hypothermia. Thick clattering of windchimes, bamboo or copper maybe, with a Japanese samurai lilt. It gets noisier, more narrative, less rhythmic but still familiar. Drippy, like vivid oil paints in the high noon sun. This music plays with temperature! It's spongy, too, like it's emanating from an absorbent object, some reverse black hole ("Willing"), not the nebulous suction sound attributed to them but harmonic, wavery after having traveled a distance, enveloping. The echoes are very strange. "Tubular Bells" heard deep underwater, a spattering of subequatorial acoustics. Drifting, but also marching, nonsensical: "Trust Nothing" is a well-thought title - trust not the beat, the century, the path of the highly varied instruments.